Summer home-selling season is here! The next few months are a great time to sell your home as many buyers wait until summer to make a move. While it means there are potentially more people who may be interested in buying your home, it also means more competition from other sellers. Make your home stand out this summer by staging it like a pro! Nothing is more off-putting than a dirty house, and it’s doubly true when you’re trying to sell. The most important thing you can do when selling your home in the summer is to clean it from top to bottom. Everything should get a thorough scrubbing, from the floors and baseboards to the bathtub and countertops. And don’t forget the windows! Buyers don’t want to look through months of accumulated grim when checking out the view from the living room. Make sure those windows are crystal clear and sparkle in the summer sun. Summer is the time when everyone wants to slim down to look good in that new bathing suit. The same is true for your house. It’s time to slim down your belongings and streamline your house for staging. Nobody likes clutter, and it can sink your home sale. Remove all personal belongings and put them in storage. If you have bulky furniture, throw that in storage, too. Rearrange what you have left to create an easy flow that makes the rooms feel bigger. Only display home décor that accentuates the positives of your house and ties into the color palette. After months of having the house shut tight, now is the time when people are opening their windows and letting the sun in. When potential buyers come to your home for a showing, open all the curtains and let in as much natural light as possible. Turn on all the lights and create a bright, cheerful and welcoming atmosphere. Summer weather often brings hot temperatures, so make sure the environment in your home is cool and inviting. Don’t be stingy – crank up the AC so nobody breaks a sweat touring your home. Display items that make a home look cooler, like vases filled with summer flowers or a crystal bowl full of oranges. 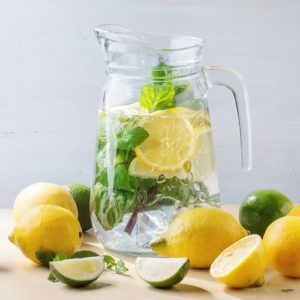 Keep a pitcher of ice-cold water or refreshing lemonade at the ready. If your home doesn’t have air conditioning and you have a hot summer ahead, it may be worth it to hold off selling until the fall when temperatures are more moderate. Lastly, don’t forget the outside! Show potential buyers how inviting all the outdoor areas of your home are. Clean up the yard and plant flowering annuals for a burst of color. Thoroughly clean decks and patios and set up an outdoor seating area or a well-dressed table that shows them how great your place can be for entertaining. Toss in some pretty outdoor pillows, potted plants and maybe even a fire pit. Add a simple summer wreath to the front door and buy a new welcome mat. Make sure your house numbers can be easily seen from the street, mow the lawn and clean the pool.